living room updates and project overload! This week is crazy project week. I hope I don't burn out on overload. 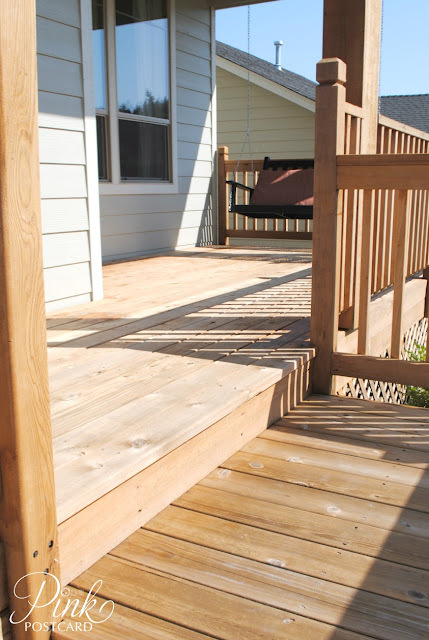 Over the weekend, we started refinishing and staining our decks. As in, two of them- the front porch and the back deck. Next Sunday, (Aug 19) is Aunt Bee's parking lot sale. If you do shows, you know that the week before is crazy trying to wrap up last minute stuff. Even though the craziness continues, I thought I'd throw something else into the mix to alleviate something that would make me less crazy. Updates in the living room!! 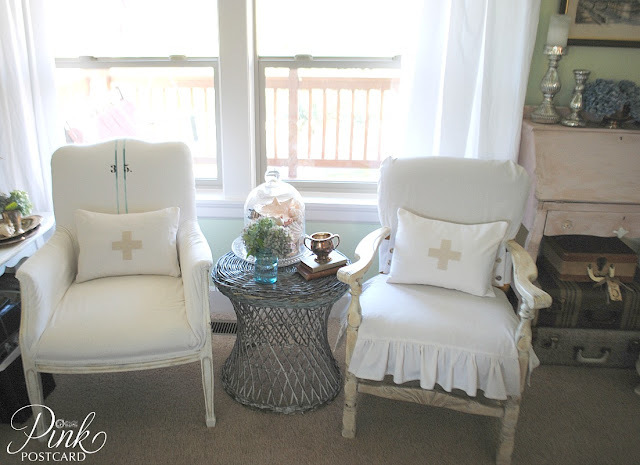 Since we have the two mismatched chairs, I thought making matching pillows would bring a pulled together look for them both. 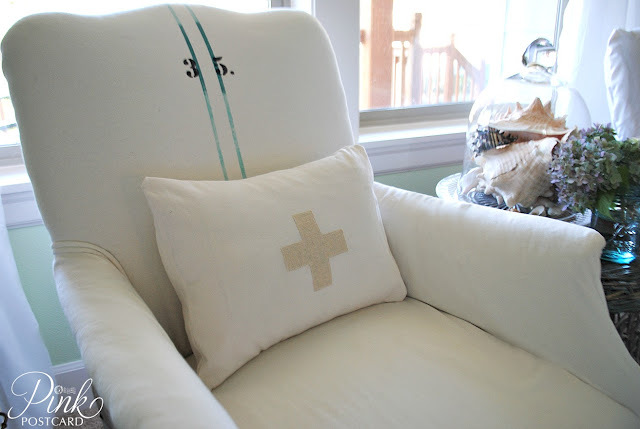 I adore the cross motif that I am seeing everywhere. And now I gotta get that stain going! We did our back deck too this weekend...what a job...hang in there! The living room looks great! Good luck with the staining! I spent a good week solid on that this summer. I personally didn't think it was necessary.. what was wrong with the grayed weathered wood? I was proven wrong when it was all finished.. I absolutely love it! Hope to share it this week if I can get some good photos. Good luck! It will be worth it! The pillows really do pull the look together! I love mismatched chairs and the matching pillows really makes the look great! Those chairs are double gorgeous. 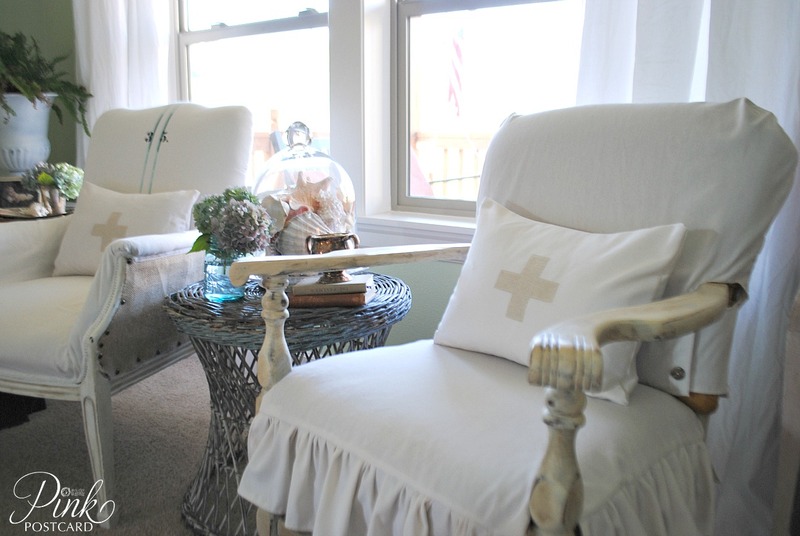 This is gorgeous.. such a simple and elegant space.. love the pillows!